Check comments below for latest discount code. Bluffworks Original and Bluffworks Chino are two similar yet subtly different pairs of pants. The Bluffworks Original is the first pair of pants the company came out with and it comes in two fits. ‘Regular’ and ‘relaxed’. I have the ‘regular’ in a size 30 and a ‘relaxed’ also in a size 30 so you can see the difference in fit. After wearing Outliers slim dungarees for such a long time though both of these pants feel pretty relaxed fit to me. If you do like a slimmer fit the Bluffworks ‘Chino’ pants might be more what you’re after.The Chino pants are much slimmer than the Originals Regular cut. So much so that I would suggest size up 1 from the ‘Originals’ size. The ‘Chino’ pants are more than just a slimmer cut. They are actually made from a different and more stretchy material. 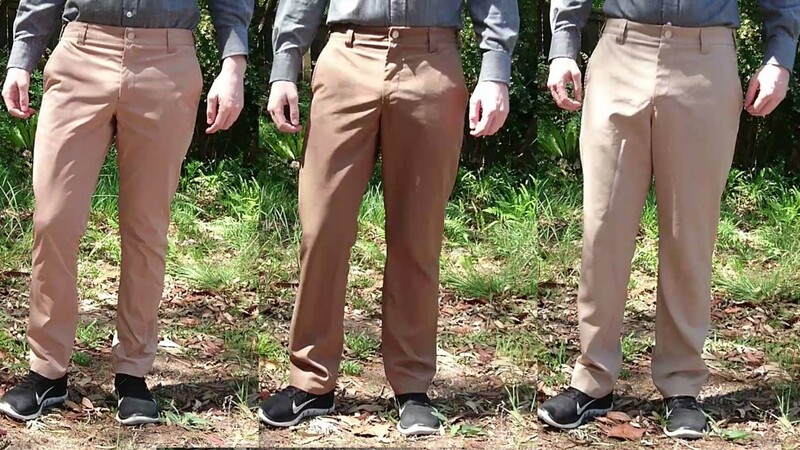 While the Original bluffworks pants instantly absorb water (and quickly dry) the Chino pants slightly repel water before absorbing and drying. The Chino pants also come with a gusset crotch (much like the Outlier slim dungarees) which help to increase freedom of movement, especially while riding a bike. One of the bad points about the Chino pants is that the material is quite noisy. It has that typical ‘nylon swishing’ sound when you’re moving about. This is something that I don’t experience with the Originals. One of the great things about all of Bluffworks pants are that they’re all wrinkle free. No matter how much you roll or pack or fold them, they won’t wrinkle. You won’t ever need to iron them either. Another great thing about the bluffworks pants is that they all have a very generous amount of pockets. In addition to the standard 4 pockets (2 on the back and 2 on the front) they also have 2 extra zippered pockets inside the main two front pockets and a ‘hidden’ pocket at the back just above the right rear pocket. The zippered pockets, while at first glance might seem like a good idea are actually not as practical as I first thought. When putting a phone into your pocket the screen rubs past the zipper, making me nervous it might scratch it. Also when unzipping the pocket you have you use two hands because the fabric will fold over itself if you try to do it one handed. Overall these are a great pair of pants for travel and they have some very packable features such as being lightweight, wrinkle free and quick drying. The price is quite affordable although at US$125 (AU$177) for the Chinos and US$93 (AU$132) for the Originals. Just make sure to get the sizing right according to the website.